No, that is not what it means at all. It means that when you tell HSM to arm away, it will wait 60 seconds before doing so. It will be disarmed during that 60 seconds. Your best bet is to look at the HSM app events, and show those. Likewise with RM. You don't show the RM rule reporting being triggered. Also, why are you using a triggered rule instead of just a trigger? Don't you just want this to happen when the Delayed Arming Away event happens? No need for condition and rule. This is not the case as I have discovered. When you arm HSM from a keypad, it enters its own exit delay countdown. It only reports status back to HE when the countdown is complete. At that time, the hub goes into armed away mode immediately with no additional countdown. So, if arming from a keypad, HE never goes into armed-delay. The only time that HE goes into armed delay is when is when it is armed from something other than a keypad. This is due to the fact that the keypad doesn't report back till the arm is complete. This is as per @mike.maxwell on another thread about the Iris keypad. So, if arming from a keypad, HE never goes into armed-delay. The only time that HE goes into armed delay is when is when it is armed from something other than a keypad. Is there any way of making a TTS warning announcement (say by subscribing to a system event) when the keypad has started the exit mode countdown? Note I realize the keypad was sent a command to issue the exit delay tones, and HE has a timed command waiting to set away mode, or be canceled should a keypad off command is issued. AFAIK keypads do not issue any messages at the completion of an entry or exit delay command. AFAIK keypads do not issue any messages at the completion of an entry or exit delay command. That is incorrect according to @mike.maxwell. From what I have been told, the keypad only issues its armed message after its exit delay. So, when armed from a keypad, there is no exit delay issued by HSM. This is very evident when you have 2 keypads, as I do. When you arm from one, it goes through its delayed exit countdown, after which HSM is armed. Then keypad #2 goes through its exit delay countdown even though the system itself is already armed. or be canceled should a keypad off command is issued. This is also incorrect if you have 2 keypads because of the way the messaging to them works. When HSM issues an arm away command to the keypads, they begin their countdown. If you were to enter your code on one and therefore disarm that keypad, the system would disarm. However, when keypad 2 finishes its countdown it will then arm HSM with no exit delay and keypad #1 would begin its exit delay even though the system is fully armed. The only way I have found is to allow the system to arm, and during intrusion delay, enter the disarm code. Now you see why I was so frustrated when I was trying to get my second keypad to work. Also, if you have only one keyad once you arm the system and it goes into exit delay, the only way to disarm it, is from they keypad. If you disarm from a dashboard, once the exit delay on the keypad is finished, HSM will be armed. I don't know if all of this is how it's intended to work or if it's the only way it can work but that's the way it does work, today. I beg to differ. I wrote the SHM Delay smartapp with full keypad support in ST. Keypads work as I explained in my initial message. Enry delay with a time. Without a hub controlling the keypad, it is a very dumb device. In ST when a disarm is received from any souce prior to an exit delayed away occurring, all keypads are set off stopping the exit delay sounds (only), and the pending software away request is cancelled. I use two keypads for various functions, they are the only devices I have not moved to Hubitat for reasons you just described. I'm just telling you what I was told and what HE does today. I know that the current behavior is what I said, since I spent two days trying to get it to work differently. If something else is possible, then give me a driver that will do that. Please!! Wow for the life of me I cannot figure out how to get the darn chime to go off during delay on setting and again on delay when opening door when alarm is set Have tried for several hours and no matter what I try in RM I am stumped. Obviously I am not that techy but giving this my all to try to get all set up. Any help on instructions is appreciated! Just too many selections and all I do is waste hours of my life with no luck, lol. Then you can put in the action, whatever you want. Remember, the hub only goes into Delayed Arming Away if you arm away from a Dashboard or Rule. If you arm away from a keypad, you only get the keypad's countdown to arming. Not HE's. Thanks. I am sure I am missing something simple. I now have it where it beeps on arming away with exit delay but cannot find a rule to allow it to beep on delayed intrusion when armed away. Also, not sure how to get the buzzer to beep solely based on the delay time. It only beeps once unless I set to repeat. Any help appreciated! I am not using a keypad, using dashboard and a piezo buzzer I have named as “chime” that is also being used to beep twice every time a door or window is opened. Still cannot figure this out. Any one have a rule set up they could share so I could copy? I was able to get it set up to send the alert to my piezo when arming away with delay but cannot figure out how to get it to beep countdown when I open the door and the alarm is set to away with a delayed siren trigger. I think I am not doing any of it correct though! How are you controlling the buzzer? Because I saw references above to a relay connected to 12v and whatnot. A piezo buzzer needs a PWM signal to make nose. You can't just throw current at it and get sounds. It needs the pulses to get the buzzer to go off. But if you have that working, then you need to look for the trigger "HSM alerts intrusion delay" or "alerts intrusion-home-delay". But remember, this is not going to be controlled directly by HSM. So, if you have a 1 minutes beeping every 5 seconds (so 20 beeps) and you disarm it after 3 beeps, you are going to need another trigger to cancel the actions of this one. Because it won't know that you don't want it to keep going unless you tell it to. So, you would need another trigger that cancels the actions of this one based on the status going to disarmed. I have a konnected board for my alarm and have a piezo buzzer attached to the board named chime and set as a beep/blink. I have the setting on the device to repeat 2 times. This gives me a beep beep sound when any door is opened. Under my HSM app, I have the use delay arming away set to 30 seconds as well as the delay intrusion away alerts. On the rule machine I set up a triggered rule named countdown chime. Under triggered events I have when HSM becomes delayed armed away. 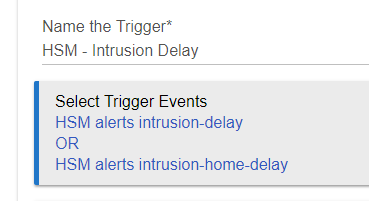 Weird thing is I do not have an available selection showing to choose for delayed intrusion alerts. When I arm away it beeps on countdown but I cannot figure out how to get it to beep on intrusion delay when armed away. Again, this selection is missing in the drop down box in the rule machine. Maybe I am doing this all wrong and just stumbled on a way to get half of it working? Any help appreciated as I don’t want my family to enter and forget to shut off alarm and with it not beeping to advise, the alarm will trigger 30 seconds later. Any help is TRULY appreciated! I am so wet behind the ears with this! Ah ha! You don't have a trigger. You have a triggered rule. Try again with a trigger. Triggered rules won't do what you want. You need two triggers. Thanks Ryan! I now have it working! Now I just have to figure out how to make it so it auto cancels the beep once I disarm the alarm. I have it set to repeat for about 15 seconds but would be better if I can program it to stop beeping when the status is changed to disarm. My head is spinning! Truly appreciate the help! You need a second trigger that cancels the repeat of the first. This one should be triggered on HSM disarming. Now, I have the same thing but what I am doing is the first trigger sets the PB to true for the second and then the 2nd sets PB to false for itself. 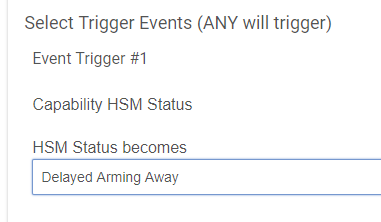 That way 2nd trigger doesn't fire every time you disarm HSM, only when there's an intrusion delay.